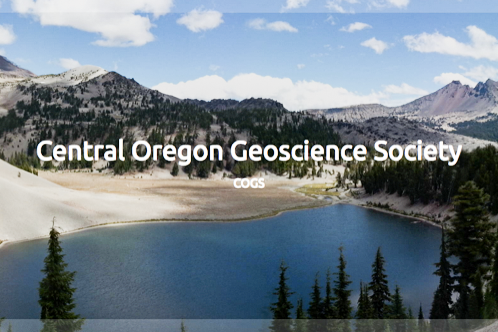 Dr. Nancy Price, a recent addition to the faculty at Portland State University and a structural geology specialist, spoke to GSOC about her research in rheology. As she described her work in the course of the lecture, Price looks at metamorphic rock outcrops and samples in order to determine the histories of events which have been recorded in their structure. Price mentioned that in explaining their structural models to others, it is often expedient for structural geologists to use food analogies. Price's discussion of her work focused on two characteristics that develop in rocks subjected to stress produced by Earth's tectonic forces - fabric and folding. A body of rock develops a fabric when the rock crystals begin to realign themselves so as to minimize internal stress. In the examples shown in the lecture fabric could be discerned as a pattern in the rock perpendicular to the direction of highest stress. Platy minerals such as mica tend to form very noticeable fabric. The fabric is clear at microscopic levels by looking at the crystals in thin sections. Also, fabric development is influenced by the type of stress field exerted by the tectonic forces. Rock subjected to a compressive event develops a straight grained fabric whereas fabric developed in a shear stress event, where rocks are trying to slide past one another, develops a fabric with a wavy texture. Folding is a more macroscopic response of the rock to the stress field. In folded rock planes become curved or squished in response to the force direction. This occurs due to overall deformation of the rock mass in response to the stress. Price showed the audience some simple diagrams of rock folded about a plane of maximum compressive stress. Price's work involves using these principals to infer events which have created rock outcrops under observation. In the real world, several factors can complicate the observed structure of the rocks and these complexities must be explained by the theorized model of events. First of all, rock bodies usually contain more than one type of mineral, and the mineral mix may be differentiated in be under tremendous pressure and/or temperatures and some parts of the rock body may melt while others remain solid, so the responses may vary within the rock mass. Also, the response of the rock to the stress field occurs over a period of time, and it takes time for the fabric and folding to distinctly record an event. On top of all this, there may be more than one event recorded by the rock structure. Price mentioned that in explaining their structural models to others, it is often expedient for structural geologists to use food analogies. Two examples she mentioned were cookie dough and jelly sandwiches. Food models help to demonstrate the complex responses of non-homogeneic systems. The first example of her work that Price described is an outcrop in Carson Nation Forest in northern New Mexico. A massive and cross bedded billion year old quartzite in the Ortega Formation overlies an ancient arc volcanic and sedimentary sequence. Some manganese and hematite rich bands interlace the quartzite at the cross bed boundaries. The folding record in the rock indicates two different compressive folding events with two different angles of orientation, but the visible fabric follows a pattern that seems to lie at an angle between the two. What has happened to this rock? The answer lies in observing the fabric of the rock more closely at an enlarged scale. In the enlargement one can see solid chunks of quartzite surrounded by crisscrossing veins aligning with both of the folding event directions. What this shows is that the rock is recording the process of moving from one orientation to the other. The solid blocks of quartzite are in the process of rotating into the new orientation. To the naked eye the two directions merge into one, misleading the casual observation of the fabric. The next example Price referred to as the “Jelly Sandwich”. This rock outcrop contains hard amphibole chunks in a schist matrix. The amphibole pieces have been flattened in two different directions (boudinages) while the schist matrix indicates slippage on a plane. So the amphibole looks like it has deformed in compression events, while the schist appears to have sheared. At the microscale the schist clearly indicates that it has done some melting and thus has little resistance to shear stress, but that has not occurred in the amphibole. This example shows the response of two very different materials in the rock to the same event, just as the jelly sandwich responds to squishing by sliding in the jelly and flattening in the bread. Haakon Fossen's Structural Geology textbook covers structural geology and does a good job of taking rheology into account. For the more technical treatment of thin section analysis (for the strong of heart): Cees Passchier's Microtectonics. Structural Geology, PSU Geology Dept.